Military personnel have embraced Call of Duty, says Kotick, because they recognize how respectful it is. The Call of Duty games are more than just entertainment, they're a tribute to the men and women of the American military. That's according to Activision CEO Bobby Kotick, who was speaking at an event on Thursday night that was one part Call of Duty: Black Ops launch party, and one part Metallica-headlined fundraiser. 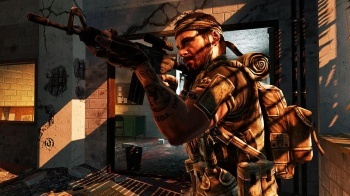 Kotick said that the games honored the "courage, dedication and the sacrifice" of America's servicemen and women around the world, and suggested that this deep respect was why the Call of Duty series were the most played games amongst military personnel. Kotick's respect extended beyond just words as well, as he pledged $1 million to the Call of Duty Endowment - a charity that helps people make the transition back to civilian life after leaving the armed forces - on top of the money raised at the event itself. Kotick also promised that the Endowment would find 1,000 jobs for veterans on top of the donation. It's naÃ¯ve to think that there's no PR component to Kotick's comments, donations and pledges, but just because there's an ulterior motive behind the Endowment doesn't mean it's not worthwhile. A million dollars a year - Activision also donated a million dollars when it set up the Endowment last year - is hardly pocket change, and will go a long way to helping the veterans that Kotick says he holds in such high regard.